See our Spring 2019 course offerings through viewing the weekly schedule on the left (click on the link below the schedule to download a PDF) and review the course descriptions below by clicking on the course number tabs. New Student? Apply for CE Status & Register for Spring! This class surveys the foundational philosophical ideas of the Buddhist tradition as presented by the great pandits of India and commented upon by the Tibetan inheritors of the Indian Buddhist tradition. The course will make use of philosophical treatises (primary sources in translation), literature, and historical analysis to present the foundations of Buddhist philosophy. Readings will include selections from Vasubandhu‚Äôs Abhidharmakosha, Dharmakirti‚Äôs Pramanavarttika, the Abhisamayalamkara (attributed to Maitreya), Guide to the Bodhisattva’s Way of Life, and 70 Topics, as well as modern scholarly analysis of the same. There will be a particular focus on the readings as they relate to the medium and great scope of the Lamrim as presented by the Tibetan scholar Je Tsongkhapa and others. Students will gain a strong foundation in Buddhist philosophy including key topics that relate to the medium and great scopes such as: cause and effect, the potential for enlightenment, the structure of existence according to the Buddhist world view. 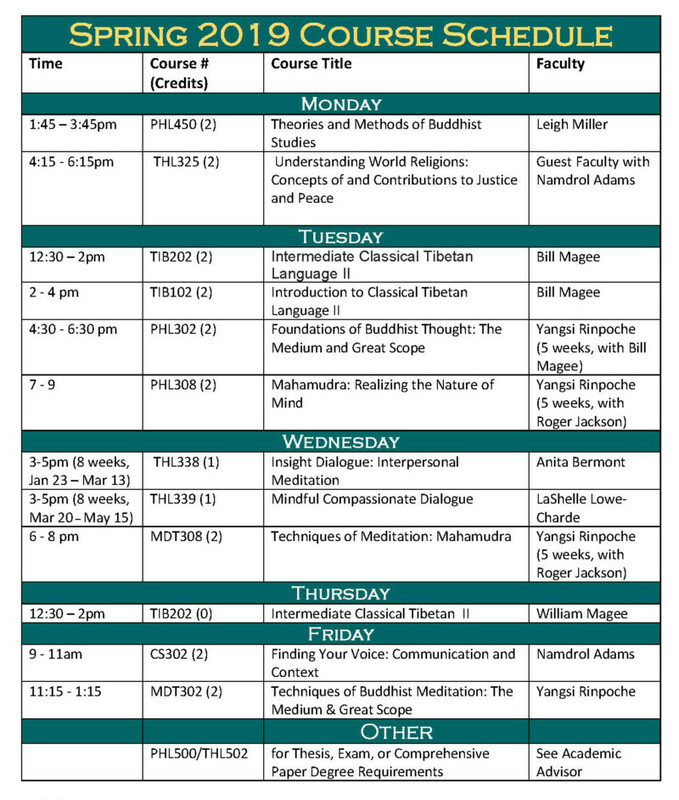 Students will gain a strong foundation in Buddhist philosophy including key topics that relate to the great scope such as: loving kindness, great compassion, and abandoning the mind of self-cherishing, as well as topics that relate to the great scope such as the mind of enlightenment, the six perfections, and an in-depth examination of the path of a bodhisattva. This course will continue with instruction in meditation based on the foundations established in MDT 301 (fall semester). The course will be taught in an interactive format, allowing students the opportunity to learn specific meditations as directed by the instructor, practice them, and discuss their experiences in class. The subject matter will parallel the topics of Buddhist philosophy as taught in as taught in PHL302. Part of this class will include regular meditation sessions out of class, the keeping of a sitting journal, and the opportunity for objective discussion on the effect of these practices on the individual’s mind. If desired, the committed student will have the opportunity to work with the instructor to design a personal meditation practice. The aim of this course is to explore the Great Seal, Mahāmudrā, which in Indian and Tibetan Buddhism is the attempt to realize the conventional and ultimate nature of the mind through a combination of philosophical analysis, calm abiding meditation, and special insight meditation. Study of the function and nature of mind is considered in Indian and Tibetan Buddhist schools to be essential for understanding how to tame the mind and cultivate realizations. We will first focus on psychological and philosophical approaches to the conventional nature of the mind through such sources as Vasubandhu’s Abhidharmakośa and Dharmakīrti’s Pramāṇavārttika. We then will turn to an in-depth study of Mahāmudrā, with initial attention to the Indian sources of the Great Seal, including such figures as Saraha and Maitrīpa, and the theory and practice of Mahāmudrā as developed in Tibet among the Kagyu. After exploring the origins and development of Geluk Mahāmudrā, we will focus in depth on the instructions for practice found in the Great Panchen Lama Losang Chökyi Gyaltsen’s root-verses on Mahāmudrā, his auto-commentary on the root-verses, and his inspired and inspiring spiritual songs. Finally, we will approach the ultimate nature of the mind through such works as Vasubandhu’s Abhidharmakosa, Candrakīrti’s Madhyamakāvātara, and the writings of selected Tibetan Buddhist masters. This course meets degree requirements as the equivalent of PHL304: A Dose of Emptiness. This course will continue with instruction in meditation based on the practices established in MDT 303 (fall semester), with a focus on deepening Shiné (calm abiding) and practicing Mahāmudrā instructions for realizing the conventional and ultimate natures of the mind. The subject matter will parallel the topics of Buddhist philosophy featured in PHL308. The course will be taught in an interactive format, allowing students the opportunity to learn specific meditations as directed by the instructor, practice them, and discuss their experiences in class. Part of this class will include regular meditation sessions out of class, the keeping of a sitting journal, and the opportunity for discussion of the effect of these practices on the individual’s mind. If desired, the committed student will have the opportunity to work with the instructor to design a personal meditation practice. This course meets degree requirements as the equivalent of MDT304: Techniques of Meditation A Dose of Emptiness. This is the second course in the service pillar at Maitripa College, which builds on the foundation of the first term, exploring concepts and practicalities related to identifying and expressing yourself as a spiritual leader in modern society and establishing a unique and relevant “voice.” We will explore traditional, historical, and contemporary “voices” of Spiritual Leadership, and mediums for expressing that voice, including online platforms, the Academy, spiritual communities, and others. This class includes a concurrent 15 hour service project. Insight Dialogue is an interpersonal meditation practice that brings together meditative awareness, the wisdom teachings of the Buddha, and relationship. It is a contemporary practice with the same purposes and traditional roots as silent meditation: developing mindfulness, compassion and liberating insight, while investigating present moment experience. The six guidelines at the core of the practice help establish the meditative qualities of the mind and to sustain these qualities while participants reflect on topics that encourage a direct and intimate inquiry into the human experience. In this way, relational contact and meditative qualities of the mind help bring root wisdom teachings into lived experience, here and now. The foundational elements of Buddhist paths to liberation include morality, tranquility, and wisdom; in Insight Dialogue these support relationships of mutuality as instrumental to the spiritual path, particularly in cultivating loving-kindness, right speech, right action, concentration, and insight. The Buddha’s teachings praising Spiritual Friendships and relational practice are also antidotes to overemphasis upon the individualistic forms of practice in dominant cultures of modernity and opportunity to awaken together. Although Insight Dialogue is grounded in the Buddha’s early teachings (Pāli Canon) and the practice of Insight or Vipassanā meditation, people of all faiths and backgrounds are welcome and find benefit in the practice. This course will offer Buddhist texts and teachings from multiple traditions, including the Pali, Sanskrit, and Tibetan Buddhist sources, in guided, interpersonal dialogue-based meditation practices. In spring 2019, this course will meet for eight weeks, on Wednesdays between January 22 – March 15. People who experience connection to core values while engaged in meditation, prayer, and other spiritual practices may also find that when they step back into daily life ‘off the cushion,’ they can get lost in a swirl of criticism, doubt, and confusion, and may not see how to really put those values into action regardless of who and what they encounter. This course asks us to look into our own values and actions, and aims to cultivate insights and the beneficial competencies to find and express compassion, love, and honesty regarding oneself and in relationship with others. Mindful Compassionate Dialogue is framework for these concepts and a systematic set of tools, formed by a combination of Mindfulness, Hakomi (body centered therapy), and Compassionate Communication (also known as Non Violent Communication). This course introduces twelve Relationship Competencies, each with six specific skills. These competencies are the manifestation of compassionate relating and wise action, and arise from nine foundational practices: Attunement, Warmth, Security, Equanimity, Clarity, Concentration, Awareness, Health, & Regulation. These nine foundational practices arise from the core intention to benefit all life (or, for some, bodhicitta). The course will focus on a selection of these competencies, skills, and foundational practices in this introductory eight-week course. As we work together, we will lean into these foundational practices to support your learning and help you create thriving relationships. In spring 2019, this course will meet March 20, and then weekly from April 3 – May 15. This course is designed to give students the methodological and theoretical tools needed to think critically about ways to approach the academic study of Buddhism. What are the goals of Buddhist Studies? What are the best methods for achieving those goals? What sorts of presuppositions and assumptions do we bring into our work and our orientation towards “Buddhism”? Do our presuppositions and assumptions serve our goals? How do political, religious, and/or ideological preferences impact our engagement with the object of study? What are the authoritative sources for the information we want and how do we determine that? How do we understand and interpret the “data”? What sorts of responsibilities do scholars have? What we study and how we study it are inextricably tied to questions of theory and method. Those who see methodological discussions as needless academic meanderings do not somehow thereby free themselves of methodological biases. Everybody engages their object of study with a theoretical and methodological orientation. The goal of this class is to encourage students to do so consciously, to think about their own assumptions and the assumptions of the broader community of scholars who engage the Buddhist traditions within modernity and postmodernity. Continued study of Tibetan grammar, syntax, and vocabulary of Classical Tibetan language. Students continue to deepen their knowledge of Tibetan grammar and syntax through reading and decoding more complex texts, treatises, poetry, and commentaries on Buddhist philosophy and practice in their original language. This course includes the continued study of translation theory, and students will begin working on their own basic translations. Students receive oral commentary of the texts they are working with as part of the class and as an aid to their understanding and translation of the texts. Understanding World Religions: Concepts of and Contributions to Justice and Peace: This course offers an overview of the worldviews of various religions and ideologies and an examination of their ideas of, teachings on, and action in relationship to the concepts of justice and peace, with special attention to teachings on such issues as war and peace, violence, economic justice, the environment, criminal justice, and social justice. This course will rely upon texts and representatives of the traditions themselves to present the core material for the class. Students are required to investigate one worldview in depth through a semester-long research project.